Since the release of the iPhone and its App Store, poker players have long dreamed of killer applications released from poker rooms and software developers to let us play and practice our skills. PokerCruncher is one of the new companies to come out with iPhone applications that are currently available in the iTunes Store: PokerCruncher, Hold'em Odds Quizzer, and Poker Odds Teacher. Although there are a ton of poker iPhone applications available in the iTunes store, none are focused on actually making the user a better poker player. Enter applications developed by PokerCruncher, which has come out with three full commercial applications: Hold'em Odds Quizzer, PokerCruncher, and Poker Odds Teacher. There's also a version available for Android phones. The first application, Hold'em Odds Quizzer, is available for only $0.99 and recently had an update that added even more quiz questions to the application. 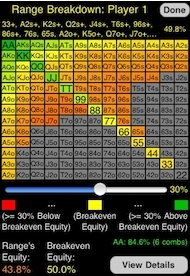 There are many different scenarios that players can be quizzed on which reflect their equity situation at a specific moment in a hand. Users can take a "General Assessment" quick quiz of 10 questions or take specific quizzes around pre-flop, post-flop, and hand range scenarios. The application is extremely easy and fun to use with results kept to see how well you score in your quizzes. There are also an outs chart and tutorial feature that come pre-loaded. Using the application is a lot of fun and is an excellent way to quiz your understanding of equity situations for a lot of different scenarios in a hand. This can really improve your pre- and post-flop play and is a no-brainer $2.99 investment. Poker Odds Teacher is a $2.99 no-frills program that helps players learn some of the math behind poker. 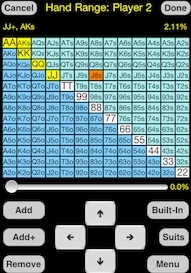 The app teaches a general method of estimating odds for different Texas Hold'em situations. There is a main menu that allows a player to punch in a situation they might face at a table to learn the proper way of calculating outs and odds. Although this application isn't incredibly powerful or exciting, you really can’t go wrong for under a buck. Tournament Cruncher, which works great in combination with Poker Cruncher, is an Independent Chip Model (ICM) calculator that teaches you the math behind the correct decision to push, fold, or call. All you need to do is put your opponent on a range (this is where Poker Cruncher comes in handy) and you’ll not only have the correct play at your fingertips, but you’ll also know what the right move is. Additionally, Tournament Cruncher is nice to have in your corner when making a final table deal, as it’ll tell you exactly how much equity you have in a tournament. For $4.99, we think it’s well worth the money. I think the price is a bit high if I compare it with Handwizard.